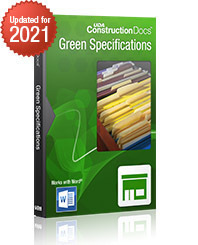 Define projects with accuracy with complete specifications for residential and light commercial construction. With UDA LC Specification Templates, you can quickly select, edit, and create CSI-based specifications books for all your projects. Specs can be modified to fit your project needs and are provided as word processing files for Microsoft Word, Works, WordPerfect and most other word processing applications. Light Commercial Specifications are part of the UDA ConstructionSuite family of products, and also available in ConstructionSuite Green Pro and above. which combines all three available UDA specification packages. Learn more.